Spiral Key To Release ‘An Error Of Judgement’ January 19th, 2017 – Rockposer Dot Com! 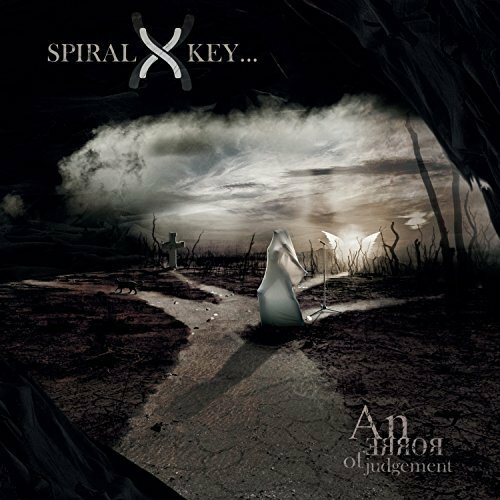 Spiral Key is a UK-based symphonic progressive metal band formed in 2012, specializing in melodic, thoughtful and heavy music, diverse themes and a subtly dark sense of humour. The band features the distinctive voice and intricate guitarwork of David McCabe and the thunderous bass work of Ken Wynne (Cut the Wire). Spiral Key released their debut ‘Perfect Machine‘ in 2013, a diverse collection of songs with a focus on melody and featuring themes of love, loss and identity. Recorded, mixed and mastered at Bentham Studios in Ken’s home town of Swindon in the UK, the album was self-released. After a short hiatus and gathering live assistance from up-and-coming drummer Chris Allan (Esprit D’Air, Merithian) and guitarist Dan Carter (Belial), Spiral Key burst onto the stage in 2016 supporting a number of bands across the spectrum including Kingcrow and Votum. After that successful year, Spiral Key’s second album ‘An Error of Judgement‘ was recorded at Outhouse Studios in the UK in early 2017, and will be released by Pride and Joy Music on January 19th, 2018. John Mitchell (Frost*, It Bites, Arena) contributes a guitar solo to the track ‘Dark Path‘, vocalist Miguel Espinoza (Persefone) features on the track ‘Possessive‘, and Dan Carter displays his inimitable style on the track ‘Sanctimonious‘. Mixing and mastering were handled by David Castillo (Katatonia, Opeth) and Tony Lindgren (Angra, James LaBrie) at Fascination Street Studios in Sweden. Artwork is the product of the mighty genre luminary Mattias Norén of ProgArt Media, touching on the paths described in the album. ‘An Error of Judgement‘ examines the many misdeeds of mankind, from the major themes of disunity and dis-empowerment to the close-up and personal failings of people themselves. Darker and heavier, it elevates Spiral Key’s trademark progressive sound to new symphonic heights, while still making space for the band’s trademark humour and melody. The first video for the album is for the track ‘Hollywood Dreams‘, by Patric Ullaeus (Evergrey, Amaranthe) in Sweden and will be released on YouTube on November 24th, 2017 in advance.